At Majors Home Improvement, we understand why sunrooms are so popular with homeowners in Pensacola, Florida. While the weather can be beautiful on a nearly daily basis, it can also be brutal – the humidity, the sudden downpours, the mosquitos. It can wreak havoc on anyone’s outside plans. But with a sunroom, you can comfortably relax season after season, enjoying the beautiful views and sunshine without contending with nature’s disadvantages. 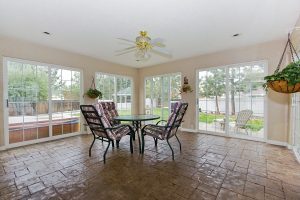 If you’re ready to enhance your home with a sunroom, Let Majors Do It! We’d be honored to come to your home and help you make your renovation dreams come true. Plus, the sunroom we install for you will be fully customized so that it looks and feels like a natural extension of your home. We can even add brick knee walls and glass transoms to add a level of elegance to your enclosure to make your home the most beautiful on the block. At Majors, we firmly believe that our customers are the lifeblood of our business and the purpose of everything we do. This is why we are constantly striving to exceed their expectations and provide the best home improvement experience they’ve ever had. We do this by treating them with respect, being attentive to their needs, and providing seamless service. And, we do this by providing Red Carpet Service, a set of internal customer service guidelines that all of our installers follow when working on a home. Red Carpet Service entails being timely, being mindful of the landscaping, being kind to pets, and leaving a home cleaner than when we arrived. Are you ready to get your sunroom installation started with Majors Home Improvement? There’s no better time than now! Contact us today to learn more about our sunrooms and installation procedures. When you call, we’ll be pleased to schedule a complimentary consultation at your home in Pensacola.